05 Nov 1947 Enlisted in the U.S. Navy as a Seaman Recruit at Denver, Colorado. ?? Jan 1950 Assigned to Camp Hale, Colorado, on temporary additional duty (TAD)as part of the "29 Detachment" from Port Hueneme, California. training equipment for the Seabee Reserves that were in ski and mountaineering training there. ?? Mar 1950 Transferred to U.S. Naval Construction Battalion Center, Port Hueneme, California. 21 Nov 1950 Honorably discharged. 22 Nov 1950 Stationed at U.S. Naval Construction Battalion Center, Port Hueneme, California. 07 Aug 1951 Transferred to Pearl Harbor, Territory of Hawaii. 14 Aug 1951 Stationed on the USS Bolster (ARS-38), Pacific Fleet. 16 Apr 1952 Appointed Storekeeper Third Class. 26 Jun 1953 Transferred to Long Beach, California. 17 Aug 1953 Stationed at Commander Long Beach Group, Pacific Reserve Fleet. 16 May 1955 Appointed Storekeeper First Class. 18 Aug 1955 Transferred to Adak, Alaska. 16 Sep 1955 Stationed at U.S. Naval Station, Adak, Alaska. 21 Nov 1957 Honorably discharged. 22 Nov 1957 Reenlisted to serve a period of six full years. 02 Jun 1958 Reported for duty aboard the USS Yarnall (DD-541), Pacific Fleet. 30 Sep 1958 Transferred from the USS Yarnall. 11 Oct 1958 Reported for duty aboard the USS Dixie (AD-14), Pacific Fleet. 01 Apr 1959 Transferred from the USS Dixie. 26 May 1959 Reported for temporary duty aboard the USS Piedmont (AD-17), Pacific Fleet. 28 Jul 1959 Transferred from the USS Piedmont. 18 Jul 1959 Reported for duty "Flag Allow" COMCRUDESPAC (Commander-Cruiser Destroyer Group, Pacific Fleet). 20 Nov 1962 Transferred from COMCRUDESPAC. 14 Dec 1962 Reported for temporary duty under instruction as student to the Service Schools Command (SSC), San Diego, California. 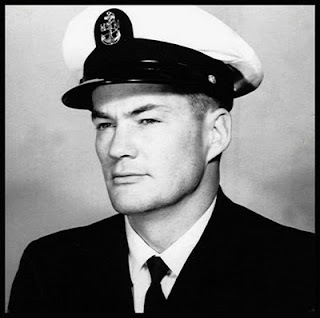 08 Mar 1963 Reported for duty as instructor to the Service Schools Command, Naval Training Center, San Diego, California. 16 May 1963 Appointed to Chief Storekeeper. 16 May 1963 Change in status to Chief Petty Officer, permanent appointment. 02 Oct 1963 Honorably discharged. 03 Oct 1963 Reenlisted as instructor at Service Schools Command (SSC), U.S. Naval Training Center, San Diego, California. 31 Mar 1966 Transferred to Vietnam. 26 Apr 1966 Reported for duty to the U.S. Naval Support Activity, Danang, Vietnam. 24 Oct 1967 Reported for duty to the U.S. Naval Support Activity, Danang, Vietnam. 22 Feb 1969 Reported for duty aboard the USS DeHaven (DD-727). Homeport: Long Beach, California (Pacific Fleet). 23 Jul 1969 Honorably discharged. 24 Jul 1969 Reenlisted aboard the USS DeHaven (DD-727). 05 Jun 1970 Reported for duty aboard the USS Buchanan (DDG-14). Homeport: San Diego, California (Pacific Fleet). 14 May 1971 Honorably discharged. 15 May 1971 Reenlisted aboard the USS Buchanan (DDG-14). 10 Aug 1971 Reported for duty to the Navy Recruiting Office, Los Angeles, California. 15 May 1973 Released from active duty. 01 Jul 1977 Retired from active and inactive service in the U.S. Navy. This commendation possibly awarded for duty on the USS DeHaven: 10 Dec - 11 Dec 1969, 14 Dec - 18 Dec 1969, or 03 Jan - 07 Jan 1970. Or the commendation may have been awarded for duty aboard the USS Buchanan: 08 Aug - 22 Aug 1970, 13 Sep - 07 Oct 1970, 20 Oct - 08 Nov 1970, or 20 Nov - 01 Dec 1970. In the mid-1950s, a fourth type of Good Conduct Medal was created when the bottom suspension bar on the ribbon was replaced with a ring. This gave the medal and ribbon the familiar appearance common to most other United States awards; this is the style currently being issued. The use of award bars to recognize repeat awards continued unchanged from 1884 until the 1930's when the name of the ship or duty station was replaced with the engraved year in which the enlistment ended. The year bars stayed in use until World War II when die struck bars for "SECOND AWARD," "THIRD AWARD," etc. were authorized. The use of all bars was discontinued in approximately 1950, being replaced with the 3/16" bronze and silver stars in use today. Each bronze star represents one additional good conduct enlistment. A silver star is worn in lieu of five bronze stars. 1. The medal will be awarded to the officers and enlisted men of the Navy and Marine Corps who shall have actually landed on foreign territory and engaged in operations against armed opposition, or operated under circumstances which, after full consideration, shall be deemed to merit special recognition and for which service no campaign medal has been awarded. 2. No person in the Navy or Marine Corps service is entitled to more than one Expeditionary Medal (either Navy or Marine Corps). Participation in more than one expedition will be recognized by the issue of bronze stars (one star for each expedition in excess of one), to be worn on the ribbon of the Expeditionary Medal. 3. At present, there is a supply of Marine Corps Expeditionary Medals on hand, which will be awarded to Marine Corps personnel participating in authorized expeditions. After this supply is exhausted, the Navy Expeditionary Medal will be the only medal awarded to either Navy or Marine Corps personnel for participation in expeditions. 4. All officers and men of the Navy and Marine Corps who, under the above-mentioned conditions, took part in an operation listed below may submit to the Chief of Naval Personnel or the Commandant, United States Marine Corps, respectively, through official channels, applications for the above medal. The applications should include the names and dates of the expeditions and a statement to the effect that the applicant actually served ashore as a member of a landing party during the period for which the medal is claimed. The National Defense Service Medal was awarded to all persons in the Naval service who served on active duty at any time between 27 June 1950 and 27 July 1954. All personnel serving on active duty during the above period are eligible for this award with the exception of reserve personnel on active duty for training, reserve personnel on short tours of active duty to serve on boards, courts, commissions, etc., and any persons ordered to active duty who, on physical examination incident thereto, are disqualified and immediately released from active duty. (Executive Order No. 10448 of 22 April 1953 and Department of Defense Directive 1348.7 of 15 July 1953.) Following the precedent of the pre-World War II American Service Defense Medal, the National Defense Service Medal has been worn by three "generations" of sailors and Marines for three distinct periods of our military history. Designed by the Army's Institute of Heraldry in Cameron Station, VA, the first medals were issued during the Korean War era and note active federal service performed as part of normal extended duty between 27 June 1950 and 27 July 1954, both dates inclusive. The next period of eligibility coincided with that of the Vietnam War, with duty between 01 Jan 1961 and 14 Aug 1974 being the criteria for the award, both dates inclusive. This amended period of eligibility was established by Executive Order 11265 of 11 January 1966. The most recent period of award encompasses Southwest Asia service, with eligibility beginning 02 Aug 1990, based on Executive Order 12776 from President George Bush on 18 Oct 1991. The terminal eligibility date for this period later was set as 30 Nov 1995. Interestingly, because of the expanded role of military reservists in "Desert Shield" and "Desert Storm," President Bush's executive order extended the medal's award to those drilling members of the Selected Reserve. Sailors and Marines with active duty in two or more of the periods wear a small bronze service star on the ribbon for each additional eligibility period. Any member of the Naval Reserve who, after 31 December 1960, becomes eligible for the award of the Armed Forces Expeditionary Medal or the Vietnam Service Medal is also eligible for award of the National Defense Service Medal. The armed forces' Vietnam Service Medal was established by Executive Order 11231 from President Johnson's desk on 8 Jul 1965.The distinctive design was the creation of sculptor Thomas Hudson Jones, a former employee of the Army's Institute of Heraldry.The service medal was awarded to all members of the armed forces who served in Vietnam and contiguous waters and airspace between 3 Jul 1965 and 28 Mar 1973. In addition, personnel serving in Thailand, Laos, or Cambodia in direct support of operations in Vietnam during the same time period were also eligible for the medal. 1. Be attached to, or regularly serve for 1 or more days with, an organization participating in or directly supporting military operations. 2. Be attached to, or regularly serve for 1 or more days aboard, a Naval vessel directly supporting military operations. 3. Actually participate as a crewmember in one or more aerial flights into airspace above Vietnam and contiguous waters directly supporting military operations. 4. Serve on temporary duty for 30 consecutive days or 60 nonconsecutive days in Vietnam or contiguous areas, except that time limit may be waived for personnel participating in actual combat operations. Individuals qualified for the Armed Forces Expeditionary Medal for reason of service in Vietnam between I July 1958 and 3 July 1965 (inclusive) shall remain qualified for that medal. Upon request, any such individual may be awarded the Vietnam Service Medal instead of the Armed Forces Expeditionary Medal. No person will be entitled to both awards for Vietnam service. Vietnam and contiguous waters, as used herein, is defined as an area which includes Vietnam and the water adjacent thereto within the following specified limits: From a point on the East Coast of Vietnam at the juncture of Vietnam with China southeastward to 21 N. Latitude, 108° 15'E. Longitude; thence, southward to 18° N. Latitude, 108° 15'E. Longitude; thence southeastward to 17° 30'N. Latitude, 111° E. Longitude; thence southward to 11° N. Latitude; 111° E. Longitude, thence southwestward to 7° N. Latitude, 105° E. Longitude; thence westward to 7° N. Latitude, 103° E. longitude, thence northward to 9° 30'N. Latitude, 103° E. Longitude, thence northeastward to 10° 15'N. Latitude, 104° 27'E. Longitude, thence northward to a point on the West Coast of Vietnam at the juncture of Vietnam with Cambodia. There are a total of 17 campaign stars authorized for the Vietnam Service Medal. Personnel are authorized one bronze campaign star for each qualifying campaign, with a silver star worn in lieu of five bronze stars. The design of the medal's suspension ribbon reflects that of the flag of the former South Vietnam—yellow with three red stripes. The green trim at the edges is suggestive of the jungle nature of the conflict. All members of the naval service of the United States who are eligible for the Korean Service Medal under existing regulations are automatically eligible for the United Nations Korean Medal. The medal was initiated by U.N. General Assembly Resolution 483 (V) of 12 December 1950. Presidential acceptance of this award for the U.S. Armed Forces was announced by the Department of Defense with its directive No. 110 23-3 of 27 November 1951. Originally entitled the "United Nations Service Medal" in the mid-1950s, a 1961 U.N. administrative change re-designated it the "United Nations Korean Medal." The designer and precise symbolism of the United Nations Korean Medal is not given in standard references. The polar azimuthally equidistant projection view of the globe encircled by an olive wreath is the universal symbol of the world body, a design which the group has used since its organization in 1945. The light blue in the ribbon—and in all emblems of the United Nations—was selected as a hue that did not appear in the flag of any member nation at that time of its creation. One anecdote suggests that the shade was designated "Stettinius Blue" in honor of Edward R. Stettinius, U.S. Secretary of State and leader of the United States delegation to the conference. The Army's Institute of Heraldry lists the color officially as "Bluebird." No official reason is given for the 17 vertical stripes, but it is an important fact that 17 member nations officially bore arms as part of the U.N. forces in Korea (Australia, Belgium, Canada, Colombia, Ethiopia, France, Greece, Luxembourg, Netherlands, New Zealand, Philippines, South Korea, Thailand, Turkey, Union of South Africa, United Kingdom, and the United States. Denmark and Italy provided medical support only). Approximately 1 million service members of the United Nations and South Korea combined participated in the action. The clasp illustrated is in English, but the medal itself was issued with clasps and reverses in approximately a dozen different languages to accommodate the native languages of participating member nations. The blue-and-white ribbon design is common to all the various medals, except that the Turkish version often is seen with a simple dark red ribbon replacing the blue-and-white version, a symbolic rejection of a color scheme the Turks perceived as representing the flag of historical rival Greece. 1. Served in the Republic of Vietnam for six months during the period of 1 March 1961 and 28 March 1973. 2. Served outside the geographical limits of the Republic of Vietnam and contributed direct combat support to the Republic of Vietnam and Armed Forces for six months. Such individuals must meet the criteria established for the Armed Forces Expeditionary Medal (for Vietnam) or the Vietnam Service Medal, to qualify for the Republic of Vietnam Campaign Medal. 3. Six months service is not required for individuals who were wounded by hostile forces, killed in action or otherwise in line of duty, or captured by hostile forces. 4. The Secretary of Defense approved a request for approval of foreign awards to U.S. Military personnel on 7 February 1966. As a result of this approval, the Republic of Vietnam Campaign Medal with device bar (1960- ) was awarded to US Armed Forces personnel by the Government of the Republic of Vietnam per Republic of Vietnam Armed Forces Order No. 48, dated 24 March 1966. The acceptance, criteria, and description were announced in the Federal Register, Volume 31, No. 147, 30 July 1966 (Title 32, Code of Federal Regulation 47). 5. The Republic of Vietnam Armed Forces Memorandum 2655 prescribed there were two devices to be worn on the ribbon. The first device was for the period 8 March 1949 - 20 July 1954 and is not authorized for wear by American Military Personnel. The second period was from 1 January 1960, with the last period to be decided after the war was over. The ending period remains blank, since the Republic of Vietnam Government ceased to exist before the ending period was established. The devices for the medal are in two sizes—the large size is 1-13/64 inches in width and is worn on the suspension ribbon of the full size decoration. The regular size is 19/32 inch wide and is worn on the miniature decoration and service ribbon bar. Since the Republic of Vietnam Campaign Medal is a foreign award, it is not issued by the United States Government. *special thanks to my sister, Margaret, for all her help with the original formatting! You're right. The top table looks terrible on Firefox (Mac) but great on Chrome (Mac) and Safari (Mac). I wasn't able to test on IE, though, because it's banned from my computer (which bothers me not in the least). I wonder what the issue is with Firefox in this case!? It's usually a very solid browser. I cannot figure out why the table doesn't view correctly on Firefox. I thought updating to Firefox v.4 would make a difference, but it doesn't. Oh well. Thanks for checking, and for the comment!